A while ago I posted about my drum room and set (http://www.dmdrummer.com/index.php?topic=3763.0) and mentioned how it allowed me to play at all hours of the day. This was true up until the first floor tenants started complaining about the bass drum (I live in a two family house on the 2nd floor, the drum room is in the basement). 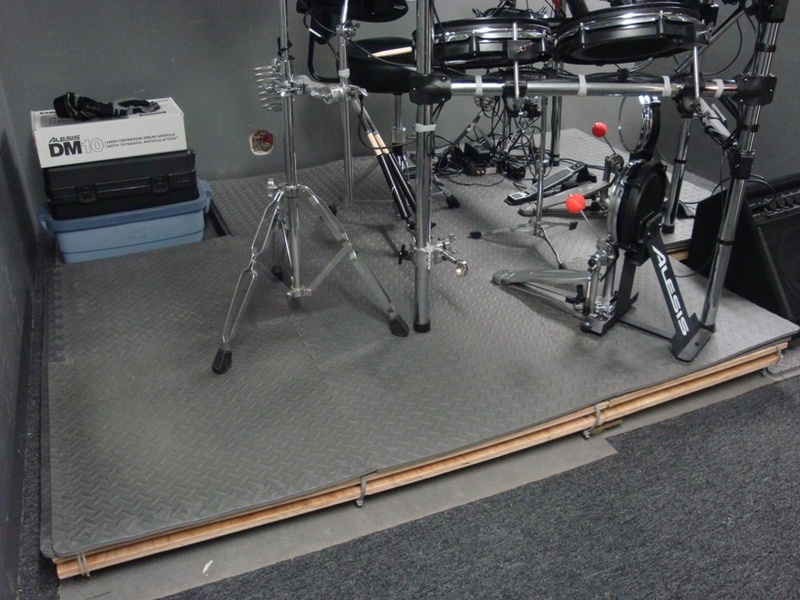 Because the ceiling of the drum room is attached to the upstairs floor, the vibration of the kick pad travels through the drum floor, up the walls, into the ceiling and throughout the first floor. It was actually bad enough to cause their vinyl player to skip. So my father and I built a two layer tennis ball drum riser that fixed the problem completely. The riser was actually built a few weeks ago and I haven't gotten around to doing a write-up yet. The bottom layer was a borrowed idea from Gerdy's drum riser (http://www.dmdrummer.com/index.php?topic=1540.0), while the second layer is a more traditional tennis ball platform. This is basically a view from the bottom, on the ground rests tennis balls cut in half [green circles], on top of the tennis balls rests 12"x12" anti-vibration pads [blue squares], the small ones along the middle are 4"4" pads which are used to keep the middle of the platform from buckling. 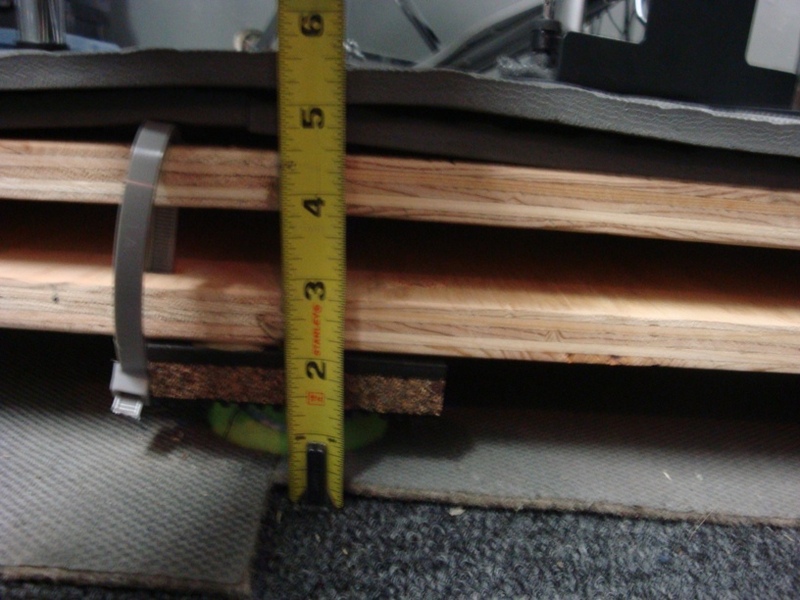 Each 12"x12" pad sits (roughly) in the center of a 24"x24" square. The dark gray line running down the middle is where two tongue and groove 3/4" plywood sheets come together (we chose plywood over mdf because it supports more weight since this project is designed with putting everything, throne and all, on the platform), since plywood is sold in 4'x8' sheets, we cut off a 2'x4' section from the end to yield sheets of 4'x6', then cut out the 2'x2' corners. In total the whole project uses 4 of these sheets, all of them are completely identical (once properly rotated and stacked, which made cutting the holes for the tennis balls a hell of a lot easier). 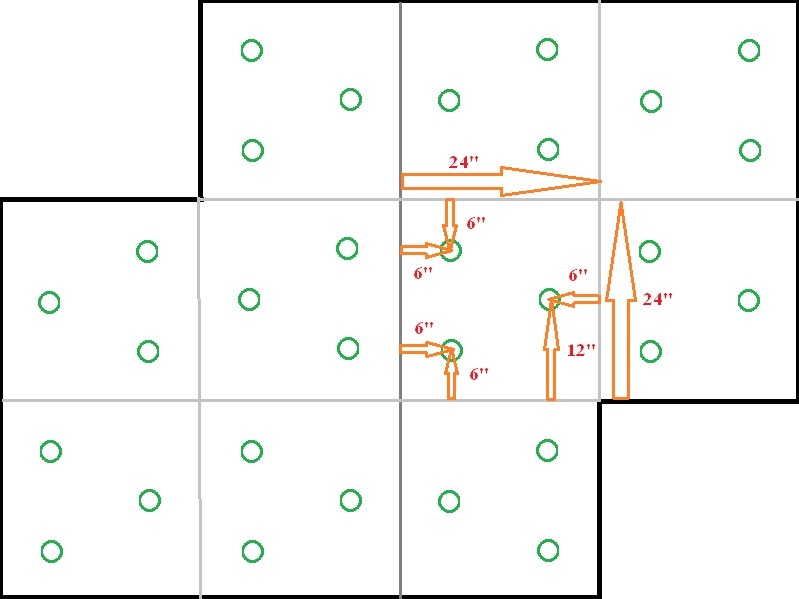 The light grey lines are used to distinguish between 24"x24" sections which comes in handy for measuring the placements of the tennis ball holes. I chose this number of tennis balls based on research of other tennis ball drum risers (in terms of square feet of the platform divided by the number of tennis balls used), I decided to use a few more than the average I calculated to compensate for my own weight. 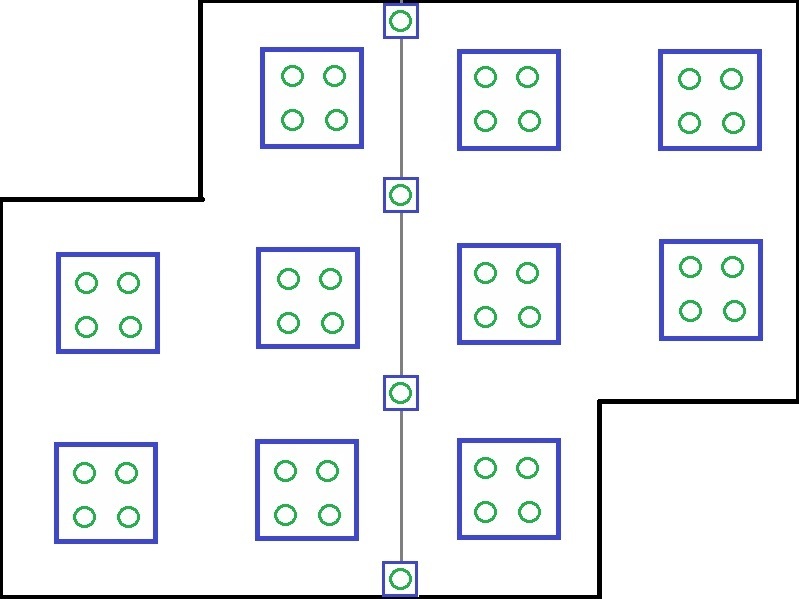 The configuration of the tennis balls was decided based on symmetry. As mentioned before, we ended up stacking all 4 sheets of plywood (two for the top layer and two for the bottom layer) on top of each other and drilled out all the holes, this saved a lot of time (I also noticed a lot of people used a cordless drill to do this, I would not recommend doing this and instead use a high powered corded drill). Each 24"x24" section uses the same measurements which are listed in the schematic. Each measurement is from the edge of the section to the center of the hole. 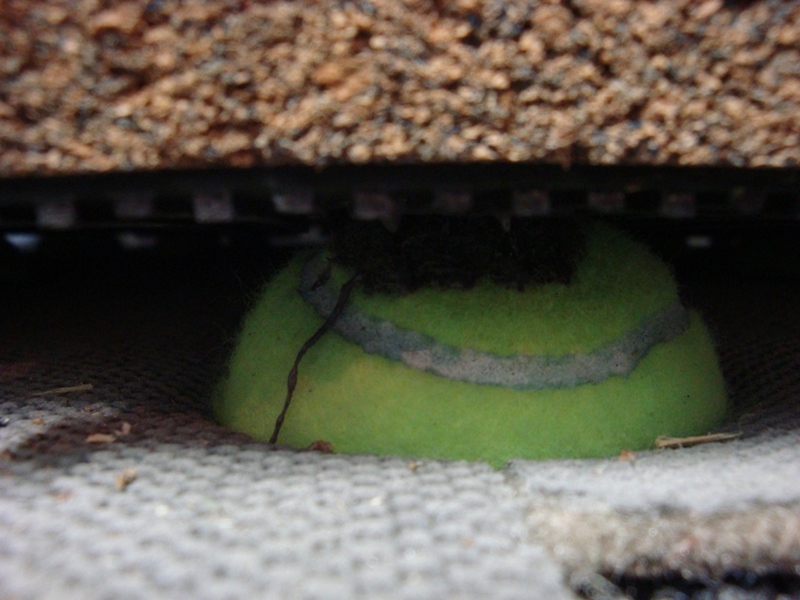 The anti-vibration pads are cold welded on top of the the halved tennis balls. I used a little over one tube for this whole project, if your platform is smaller you'll probably only need one, you will also need a gun that supports 28oz cartridges. For additional security, we zip tied the plywood sheets together, tighten them just enough without compressing the tennis balls any further. 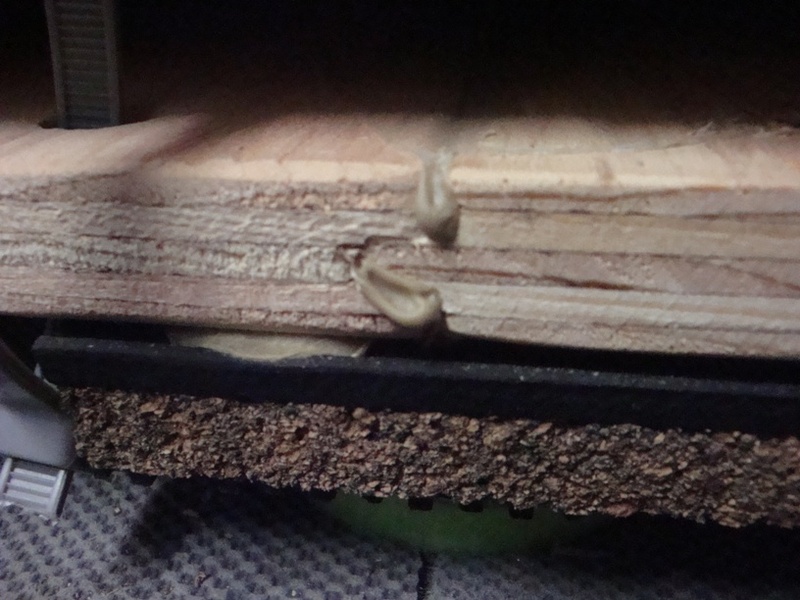 For the top layer of plywood, we secured the tongue and grooves with a brace that was screwed into both sheets. It's extremely important not to build this drum riser up against any walls, otherwise you're negating its effects. Through my research, I've heard the argument that you should always build the drum riser to be completely symmetrical, I don't subscribe to this theory at all, so I built a riser that wasn't symmetrical (because I would never put a drum amp on the platform) and in my experience it works all the same. In all, the platform adds about 5 1/2"
Would have been easier to just move. 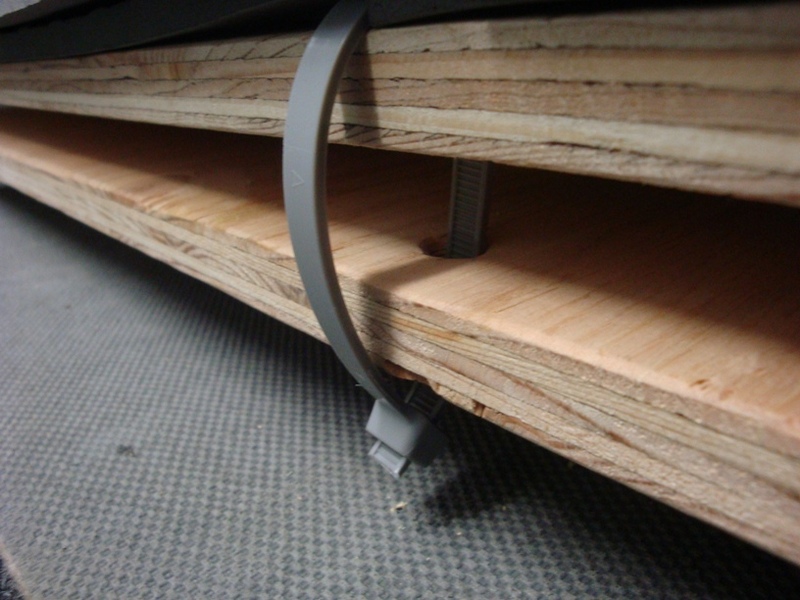 I posted an idea about using a remote Cajon pedal as a work-around for kick noise transmission--it wouldn't be perfect but it might keep a guy off the streets! I will check out your full post when I have time. Thanks for sharing!! That looks really nice! Well done, looks like you and your dad had fun doing it! How much did you spend on the project? I noted that just four of the pads would have cost $56, so I'm figuring around $400 at least. It wasn't absolutely cheap, but compared to pre-made alternatives like the Auralex platfoam, it's not only cheaper but more effective (based on comments from those who use the platfoam). I don't remember how much the plywood costs, we had it delivered from a local lumber yard so prices may vary based on location. I bought 70 used tennis balls (you're going to want extra in case you screw up cutting them in half) for about 40 bucks. 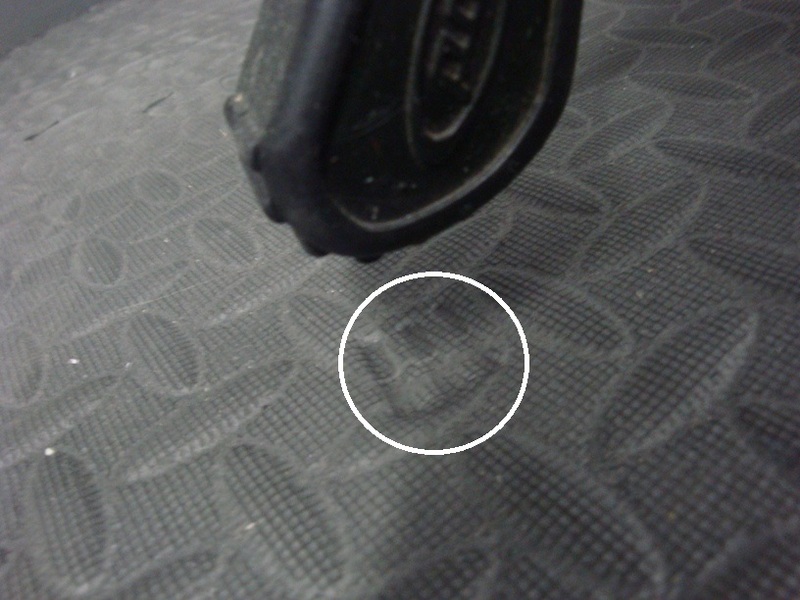 The anti-vibration pads totaled about 160. Yeah we probably spent about 400, considering the drum set alone is worth over 2 grand, along with the cost to build the room, it didn't make sense to have that money spent already and not be able to use it that often. If you build a smaller version of this, obviously it'll cost less and it should work just as effectively as this one. 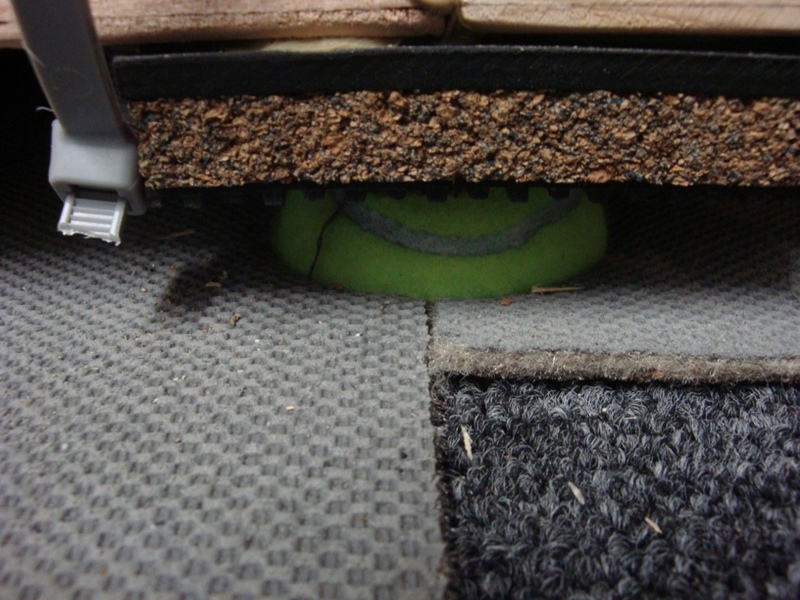 The decoupling effects are three times as pronounced as the standard tennis ball platform because s shockwave gets reduced through the tennis balls, the antivibration pads, and then the halved tennis balls. Looks great. I wonder, does the drum throne wiggle alot when you play as it's on the risers also? I put my throne on the floor and kept the set on the risers. They aren't a tennis ball riser though. I have the twin mattress and foam and plywood risers, lol... Very nice drum room. 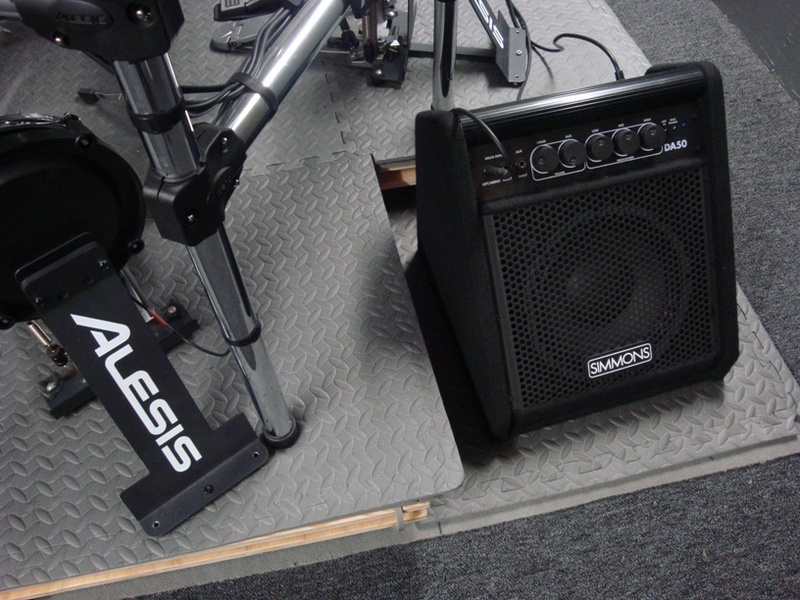 They sell alesis banners on e-bay. I actually ordered the protoype a couple years ago and Kevin decided to continue selling them. That would look cool in your studio. The throne doesn't wiggle at all, the legs are dug partly into the anti-fatigue mats which keeps it in place. The banner is actually a cool idea for the room, good suggestion. The throne doesn't wiggle at all, the legs are dug partly into the Wartrol anti-fatigue mats which keeps it in place. The banner is actually a cool idea for the room, good suggestion. $400 sounds pretty cheap for what you created here. Great job!